These three masks of paper-mache with polychrome, leather, gilding and mirrored glass inlay were made to adorn dancers in a khon or masked dance drama. 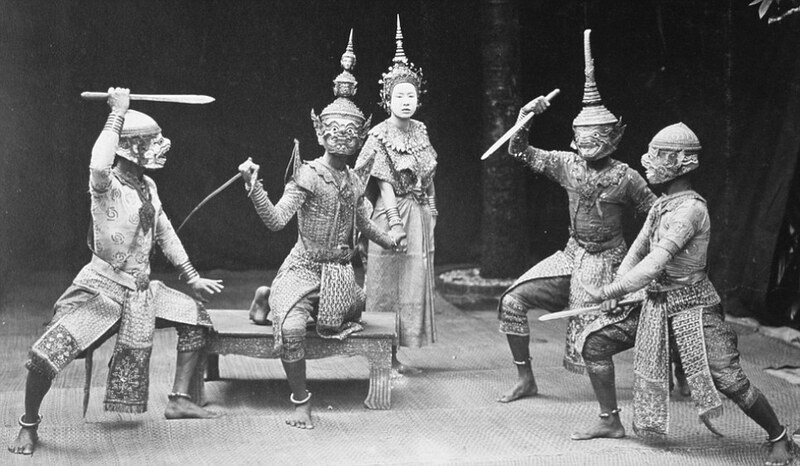 Such plays were very popular in 19th and early 20th century Thailand. Many such performances were based on the Ramakein, the Thai version of the Indian epic the Ramayana. The khon based on the Ramakein (also Ramakian) is believed to have been developed in the southern Thai city of Nakhon Si Thammarat where Indian culture first made its impact from where it is likely to have spread to the rest of what is now Thailand and Cambodia. Khon performances were particularly popular among the royal courts who had the means to underwrite such lavish spectacles. The Thai king Rama I and his courtiers even wrote one version themselves in 1798, based on their recollection of texts that had been destroyed at the old court in Ayutthaya when the Burmese sacked the city in 1767. The Ramakein is a long and complex tale with 138 episodes and 311 characters and taking more than 720 hours of continuous performance. The masks here are of Hanuman (predominantly white), and two fanged demons, probably Phiphek and Satasun. The masks were made to last only a few seasons and were constantly repaired. The examples here show evidence of use, wear, and repair, with some over-painting and so on. There are losses and they do show their age. 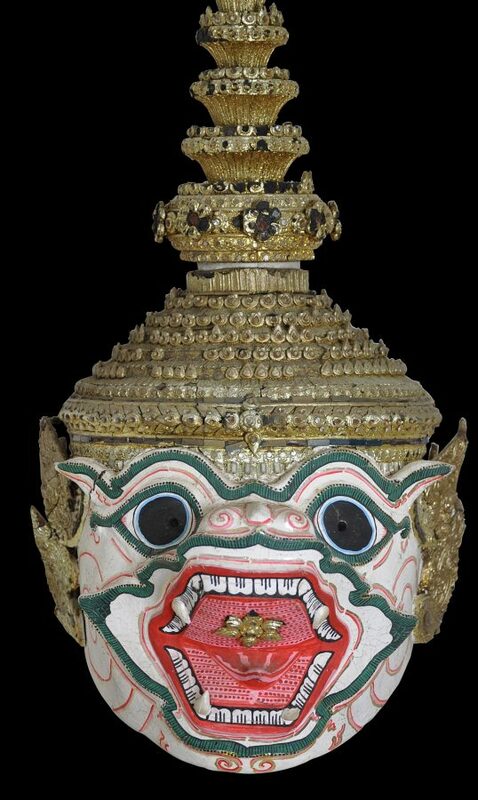 Indeed, khon masks that show no wear and no repainting probably were never used for actual performances. It is the wear and the repainting that is authenticating. But essentially the examples here are intact. Each has its own custom-made wooden stand. McGill, F. (ed. 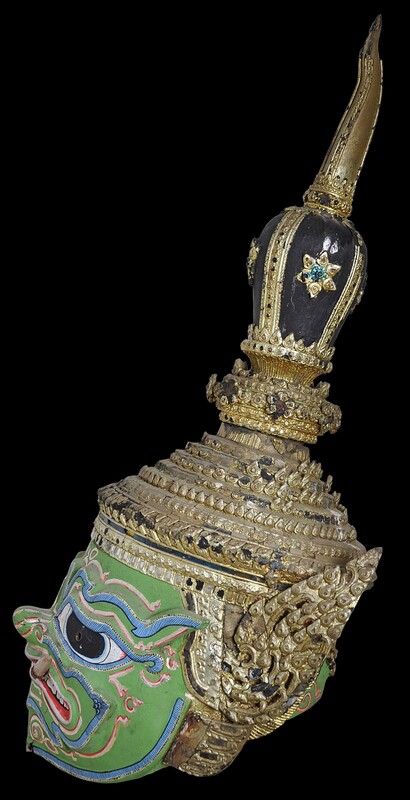 ), Emerald Cities: Arts of Siam and Burma, 1775-1950, Asian Art Museum, 2009. 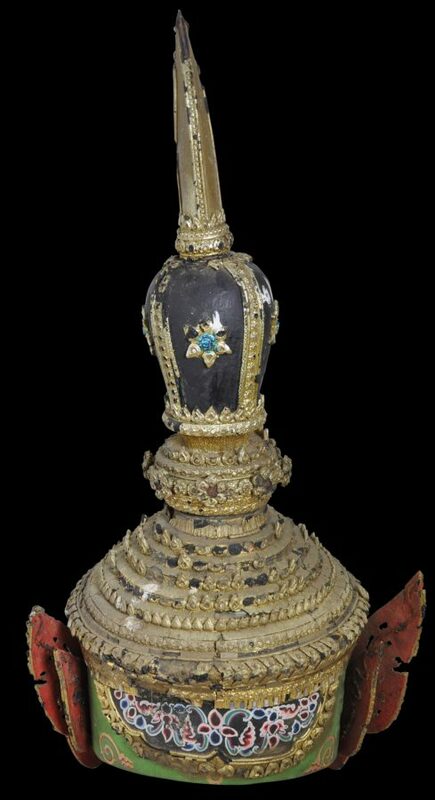 McQuail, L., Treasures of Two Nations: Thai Royal Gifts to the United States of America, Smithsonian Institution, 1997. Warren, W., & L. Invernizzi Tettoni, Arts and Crafts of Thailand, Thames & Hudson, 1994.